1. Visit Villa del Monte Winery. 2. Taste wine at Villa del Monte Winery. 3. Meet friends at Villa del Monte Winery for a unique winetasting experience. 4. 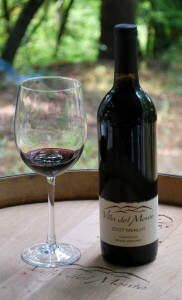 Bring your favorite Villa del Monte wine to a Memorial Day picnic. 5. Celebrate our soldiers, and toast our freedom. We will be open for tastings from 11 am to 5 pm on Saturday, May 28 and Sunday, May 29. Hope to see you!